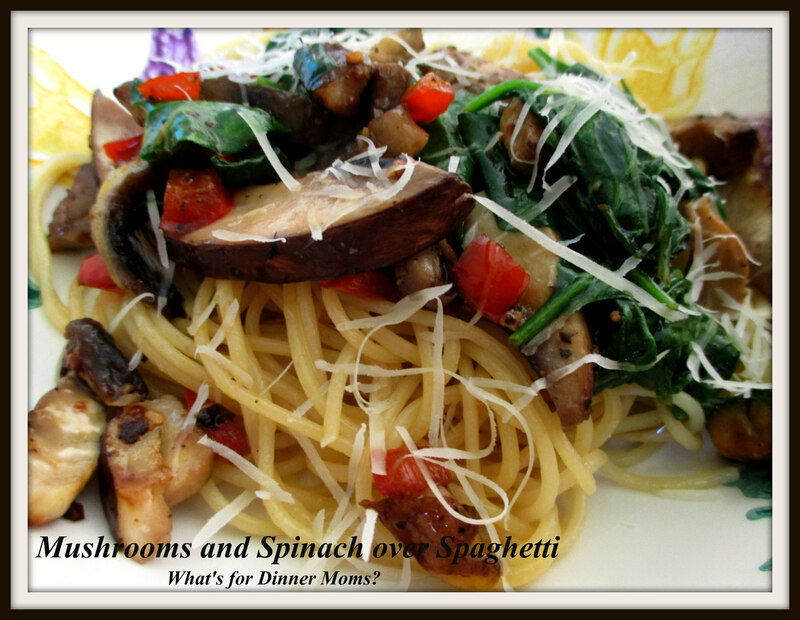 Refrigerator Spaghetti – What's for Dinner Moms? Sometimes I need a quick meal on the table in under 30 minutes. This is it! The kids had lessons and needed to eat before we left for the night. Both of them were hungry and wanted food. I need to have a dish that is easy to put together and they will be happy eating. I came up with Refrigerator Spaghetti. This dish has endless variations that you can mix together in no time at all! I open my vegetable hydrator drawer and pull out all the vegetables I want to use or that need to be used up and start chopping. You can use any combination of vegetables that appeals to you and your family. We had mushrooms, spinach, 1/2 a red pepper and a small piece of Parmesan cheese to use last night. Other nights I have used onion, green pepper, summer squash and tomatoes. Use your vegetables before they wilt or start to mold! If you are not making vegetarian meal use up the last of the leftover chicken, beef or pork in this dish too. If it is already cooked add the meat toward the end so it has enough time to heat through. If the meat is uncooked chop it into bite size pieces and cook that first before adding the vegetables to the pan. Make a pot of spaghetti. Drain when cooked. Return to pan and drizzle with olive oil. Stir well so that it does not stick together. While the spaghetti is cooking begin sauteing your vegetables over medium heat in a bit of olive oil. Begin with longer cooking vegetables like onions, peppers, celery, etc…. Add any crushed or minced garlic or other spices and let them warm in the pan before you add the second layer of vegetables to your pan. As each additional vegetables begins to cook add the next in finishing with things like spinach, mushrooms, and tomatoes that you may just want to warm through or wilt. Taste and adjust spices or add olive oil as needed to keep the vegetables from sticking to the pan. Serve vegetables over spaghetti with ground black pepper and a bit of your favorite cheese if you like. Previous Post Wait! You’re Writing About Chinese Takeout for Your 600th Post?